Jody, our State President, sent me a copy of the report by the Connecticut Science and Technology Education State Consulting Committee. It is a report on how current policies hinder Connecticut’s Agriscience schools. You may recognize the term vocational agricultural schools or VO-AG schools. The term was recently updated to Agricultural Science and Technology or Agriscience to reflect Connecticut’s agricultural demands. Presently there are 19 Agriscience schools scattered around the state. Most are attached to local high schools or ‘host schools’. Two centers, in Bridgeport and New Haven, have their own facilities and specialize in aquaculture. These high school level schools were started in 1920 to train and encourage youths to enter careers in agriculture. The report states that these “schools portray public education at its best.” The schools have a balanced mix of parent, community and industry involvement. They bring in farm producers and other agricultural industry leaders speak at the schools. Through involvement with the FFA students acquire leadership and public speaking skills. Anyone who has attended the State Grange agricultural program has met many of the FFA leaders and heard them speak. The report also mentions that the state’s ag centers have achievement test scores meeting or exceeding the proficient levels in math, science, reading and writing. 53% of Agriscience students go on to earn college degrees. There are not enough trained students graduating from our Ag schools each year to meet the growing needs of Connecticut’s farms and agricultural businesses. Agricultural businesses are forced to hire undocumented or untrained workers and many positions go unfilled. Presently there are approximately 3,200 students enrolled in the Agriscience program in Connecticut. None of the ag centers are filled to capacity. A root of this problem has to do with state funding that is allocated to Agriscience programs. Connecticut has reduced state contributions to these facilities by 15 percent this past year. These funds help schools maintain and acquire up-to-date equipment. There is also a staffing shortage. Total staffing of the Agriscience program, including administration and teachers combined, is about 125 for the 19 centers. This has resulted in the schools not able to enroll as many students as the facilities can handle. Per-student funding has been reduced to a point so it is not cost effective for towns to fund students who wish to attend these schools. Towns have to pay about $8,000 per student and provide transportation to the ag school. Some towns actually discourage students from attending Agriscience schools. At one time the state reimbursed the sending district 50% of the cost, this was later reduced to 25% then eliminated altogether. State funding for Technical (Vo-tech) schools for 2011-2012 was over $12,000 per student while the Agriscience schools received only $1,417 per student. The report makes recommendations such as increasing per pupil grants to hosting towns to cover the cost between the tuition received from the sending towns and actual costs and to restore the state reimbursement grants given to host schools districts. Also to assist in adequate teacher recruitment and training ag-science teachers, and to address restrictive state and federal labor laws to allow student internships. Governor Malloy has shown that he is a strong supporter of the agricultural community. This year he is addressing education as his main focus of his budget. The Governor and state legislature has to acknowledge the success of the Agriscience program. Underfunding and lack of support of Agriscience schools is something that must be addressed. 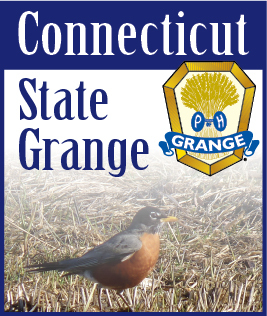 If anyone would like a copy of this report, email me at legislative@ctstategrange.org and I will send one out to you.